Good evening all, apologies for the lack of posts but we had a wonderful unexpected visit from some friends from Northern Ireland and so have been quite busy! I knew that most of the lovely ladies attending the party were scrapbookers rather than card makers, it's almost impossible to make a scrapbook within the time frame of a party so I decided to showcase some techniques and papers that could be used for card making and scrapbooking alike. This card uses my absolute favourite designer series paper from both catalogues, Elegant Soiree. This set in blues browns and creams coordinates beautifully with Marina Mist, Crumb Cake, Soft Suede and Baja Breeze, to name a few. I took these colour suggestions from the catalogue and this is the result. 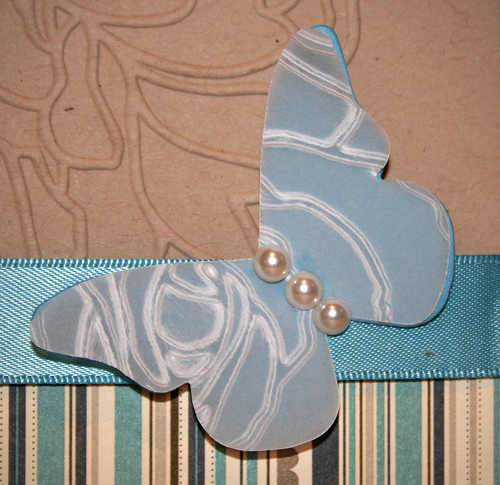 I especially love the embossed butterfly made out of vellum card, this is so lush to work with! 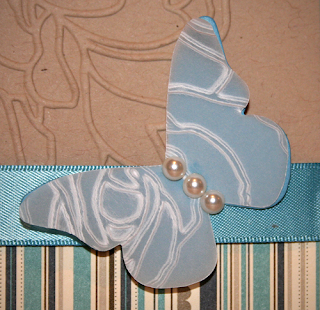 I also can't resist the combination of this paper with pearls, the result is so elegant and luxurious. 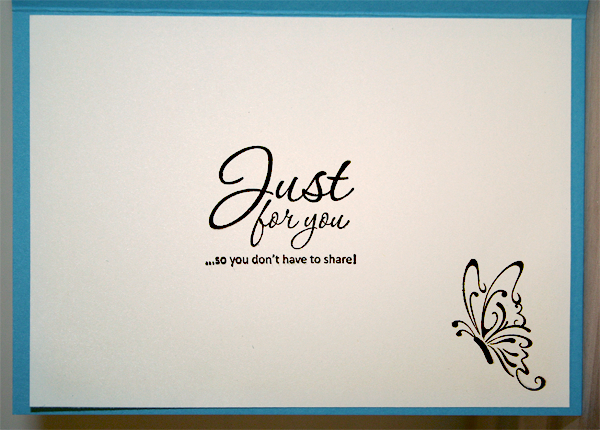 We used Marina Mist as the base for the card as I though this brightened the card. It also gave it a really lovely solid base, but it can be quite hard to see writing on this shade of paper so I added an insert to the card in Very Vanilla. The sentiment in the middle is from the lovely hostess set "Afterthoughts" and the elegant stylised butterfly is from "Thanks for caring". "Thanks for caring" is a really easy stamp set to overlook as it's sentiments are primarily sympathy based, don't overlook it though as the butterfly and flower are gorgeous, and unfortunately we all need sympathy sentiments at times. I really hope that you like this card, remember that Stampin' Up are offering a huge extra £20 to spend for hostesses with qualifying orders, so why not book a party today. As you have seen, if there are products you are interested in or techniques or styles you like I can incorporate them into your project for your party. As a reward for all my lovely customers I am offering a prezzie to anyone booking a party with me this month, it could be a stamp, some ribbon, an ink pad or maybe all three. You get to pick the present at your party and it is on top of all the Stampin' Up benefits. To my lovely customers who prefer to order just for themselves I am offering free postage on any orders over £25. If I get enough orders to qualify for a hostess benefit I will draw names out of a hat to receive the Stamp set and the free products so you could win either one! Looks lovely Clare - lovely colours!